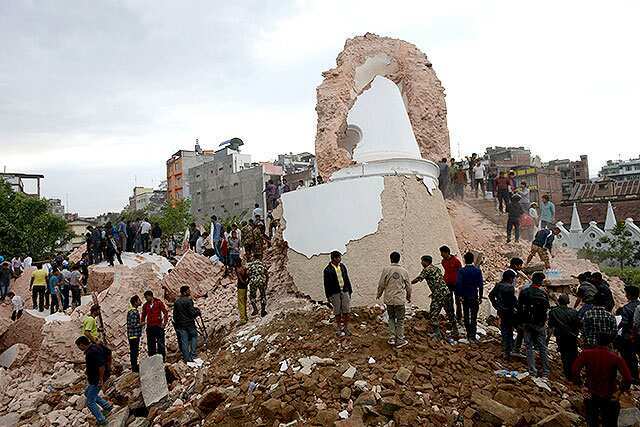 When The World Around You Crumbles . . . .
Popular 200 ft. tower landmark in Nepal, gone in an instant. A gentleness settled across her face as she said, “I know that what you are saying is true, that God can often bring much blessing out of tragedy. That is what I am clinging to right now.” We spoke for some time about the blessings that could come out of the catastrophic shift that had taken place. Soon, as her little one finally relaxed and fell asleep in her arms, she also closed her eyes and drifted off in exhaustion. When the plane finally landed she opened her eyes and smiled–HOME! They were finally home! Doing what I could to help, I gladly held her little one briefly as she gathered their few belongings. Then, almost in an instant, they were gone. Only when they were finally out of sight, did I realize that I would never forget her–even though I never learned her name . . . .
‹ PreviousChristian Joy Is Not Man-Made . . . .
How lucky for this young woman that she sat next to you! Some one wise enough to listen, and comfort with your wise words. love you, cuz! Oh Kris, thank you . . . I love you too! Isn’t it amazing that God who tells us He is completely in control, to not fear, would use us as He did you, at the right time, and place to offer comfort and encouragement.